he idea that the BJP might lose in 2019 is slowly taking shape. It is an odd shape – like a silhouette of NaMo and RaGa playing a game of Twister over an India map while trying not to be poked by a scaled-down Statue of Unity sticking out of Gujarat. It makes for interesting satire, but bleats impotent warnings for what might come. Like most educated Indians I meet, I have no strong party affiliation. We know what we don’t want and always have a gripe against something the current regime is doing. But ask us who we want instead, and the answers are sparse. We stare sheepishly at our feet like toddlers who claim to know everything but go quiet when queried on any topic of substance. It is fair to say that I want what most want: for the person in-charge to just do their job. At the same time, anyone with half a brain knows it’s never that simple. We decry our current PM for his failed experiments and dubious non-secular leanings while also accepting that even the most well-meaning strongman would struggle to control everything. We stared, googly-eyed, while promises of acche din and swacchh bharat were made, but realise – like much of the world – that nothing really changed in five years. When the BJP lost in 2004, we said, “It’s about time.” When they lost again in 2009, we were pleasantly distracted by the poor showing of the CPIM and the idea that a stronger coalition might mean better policy enactments. When Congress lost in 2014, we were back to “It’s about time.” Somewhere in the middle of all this, Arvind Kejriwal sprinted through like a streaker at a cricket match. We all hoped he’d put something on and make a showing of it, but that was not to be. Now as we stare into the abyss of 2019, we realise that all we’re doing is churning dirty water back and forth, because at least that collects fewer germs than stagnation. It is fair to say that I want what most want: for the person in-charge to just do their job. At the same time, anyone with half a brain knows it’s never that simple. In much of the developed world, bi-partisanship sort of works. Parties periodically toss power from one to the other and the idea that the rug will be pulled out from under them at the next election keeps them on their toes. Closer home, we have seen the effects of this in a state like Tamil Nadu. While the state maybe no gold standard on the global level, one can argue that the constant risk of losing power (thanks in no small way to a population that prides itself on political opinion) has kept development moving in the right direction compared with the rest of the country. Keep in mind this is also the state that built a temple for the actor Khushboo, so they do deal in their own brand of eccentricity. The other side of this model can be seen across the border in Karnataka, where a third party steps in and disrupts everything. Convinced they will not hold on to power, parties decide instead to squeeze as much from the system as they can during their term. A reasonable man may argue that by doing some good they may instead avoid defeat, but anyone watching Bangalore’s descent into chaos knows that “reason” is currently stuck in a traffic jam, wondering if it will ever reach home. That India can even claim some measure of bi-partisanship at the centre level is in itself a big deal. Recall the heydays of the ’90s, when Lok Sabha sessions were basically large-scale games of musical chairs. It was like watching Bigg Boss – you never knew who was going to win, but when they did you were always shocked and never happy. I daresay when HD Deve Gowda – lungi awry – plonked himself down on the last musical chair to claim the title, the nation had the most collaborative “Whaaaa?” moment in history. So, all this leads to the ultimate choice: A second chance versus the risk of stagnation for our current government. Convinced they will not hold on to power, parties decide instead to squeeze as much from the system as they can during their term. A second chance for the BJP may mean they get to see through on some of the policy measures they put in place. True, demonetisation is seen as a massive failure, but GST was a step in the right direction, even if execution in some areas remains sketchy. The recent RBI brouhaha doesn’t paint a great picture for central bank autonomy, especially with the man they have made governor (#InternationalManOfHistory), but the UPA was pushing for the same thing when they were in power. On the other hand, we’re all genuinely worried about what happened the last time we gave a government a second chance. UPA II was when all the scams came to the party. The 2G scam was thrown out, but the others set the dance floors alight and still refuse to go home. All this is to say nothing of anti-secularism, which is the most common complaint we all have with the current government. Surprisingly, I’ve met Muslims that are okay with the BJP because they feel that overall, the business climate has improved. I also know Hindus that are furious, because all they want is a nice rib-eye steak at an upmarket Mumbai restaurant. We’re all ultimately making our own private deals with the Devil, because these are the only deals available to be made. Whatever the result in 2019, what we’re most afraid of is the C-word. You know: Coalition. We worry about this as we ponder whether to leave that dirty water as it is, or maybe give it another churn just to see what happens. Adhirath Sethi is a novelist based in Bangalore. He sits around waiting for beards to stop being cool, because he can’t grow one. If you see him online, don’t engage… he’s just there for the stalking. Money Matters Yeh Dosti… Is Adani the Government’s Biggest Beneficiary? Across the spectrum of government-allotted projects, it appears there is no pie in which Adani does not have a finger. 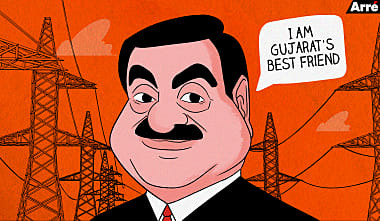 The Gujarat government rescued the Adani Power Project from the brink of bankruptcy. Adani is the sole beneficiary of the Vizhinjam and Mundra Ports project and will soon to be handed over control of six airports. It takes special talent to be Anil Ambani. He took a billion-dollar business, one half of one of India’s largest corporate empires, and dwindled it down to nothing. After the Supreme Court order that has asked him to pay ₹453 crore, will history remember him only as Mukesh’s unsuccessful brother? Money Matters Do the New FDI Rules Mean the End of Big Fat Online Discounts? Online giants Amazon and Flipkart have been messing with our local retailers and with elections round the corner how can the government not show concern? They have tightened FDI rules for e-comm. But will this impact customers? Money Matters Kahani Ghar Ghar Ki: Should India Be Worried About Its Household Debt? As reports surface of a doubling of the Indian household debt, it’s a good time to pause and assess the situation. Is this merely a blip in our spending activities, or are we veering toward a westernised consumer culture as feared by so many of our right-wing leaders? Money Matters Budget 2019: Is the Income Tax Slab Enough to Make Us Forget about Unemployment Rate? The super-populist interim budget of 2019 had something for everyone – small farmers, the middle class, and retirees. Considering this is an election year, we expected nothing less than a budget to appease the masses. For once, the government has not disappointed.